I’m guilty of “casserole overkill,” having prepared this meal comprised of two separate baked dishes. But oh how nice they were! The two shared the same 350-degree oven. 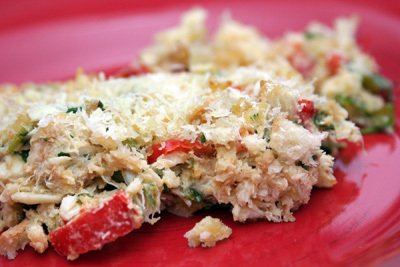 First, I tried the “Crab and Red Pepper Casserole,” from Quick and Easy Low Carb Cooking for People with Diabetes, by Nancy S. Hughes, knowing that I would economize the recipe by using three cans of Crown Prince Natural Fancy White-Lump Crab Meat, rather than the suggested pound of fresh crab. Again, I enjoyed the kick of making my own breadcrumbs in my food processor. I translated “2 oz. French bread” into half a ciabatta roll. I cooked my chopped bell pepper in a drizzle of olive oil, instead of the more modest “cooking spray.” Other decadent replacements included using a mixture of 1/4 cup of cream and 1/4 cup 1% milk, using 5 Tbsp. and 1 tsp. of butter instead of margarine, drizzling the casserole top with olive oil before it entered the oven, and doubling the final sprinkle of Parmesan cheese to 2 Tbsp. This unashamed display produced quite a rich dish. I halved the amount of cayenne pepper, in the interest of my child’s palate. My chosen “seafood seasoning” was Old Bay, which is so distinctive and fun. I added 1 1/2 tsp. salt to my casserole, then baked it for 25 minutes. We enjoyed this nice, spiced dish. And then I made the “Amazing Butternut Squash,” from Allrecipes.com, customized for four servings. This one was topped with a crunchy topping of cracker crumbs, Parmesan cheese, and butter. Instead of using saltines, I used Quilts, which are a sensible version of Triscuits. Hence, my topping tasted unmistakably like these crackers. I was fine with that. My butternut squash was soft after 5 minutes of simmering. I added 1 1/2 tsp. salt and 1/2 tsp. black pepper to my mix, then baked it for 45 minutes. 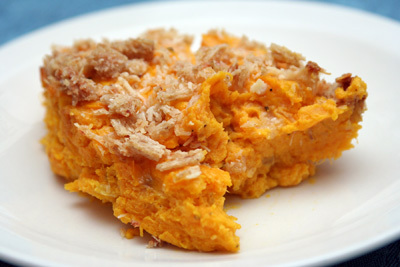 What I got was a smooth, sweet, and lovely casserole. This meal should be enough of this stuff for now, right? Next time, I’ll calm down after my casserole craziness to cook the “Rosemary Turkey Meatloaf,” from Allrecipes.com, along with “Cream of Asparagus Soup,” from The Complete Diabetes Prevention Plan, by Christopher Saudek and Sandra Woodruff (recipe below). Return to my site on Saturday, March 21, to witness my tasty fun. Put the margarine or butter in a 2-quart nonstick pot and melt over medium heat. Add the scallions, cover and cook for several minutes, until softened. Add the garlic and cook about 10 seconds, just until the garlic begins to turn color and smell fragrant. Add the broth, asparagus, herbs, salt and white pepper and bring to a boil. Reduce the heat to low, cover, and simmer for about 8 minutes, until the asparagus is tender. Pour the mixture into a blender and carefully blend at low speed to purée the asparagus. Return the mixture to the pot. Place the milk and flour in the blender and blend to dissolve the flour. Add the milk mixture to the asparagus mixture. Increase the heat to medium and cook, stirring frequently, until the soup begins to boil. Cook, stirring constantly, for another minute or two, until the soup thickens slightly. Serve hot.